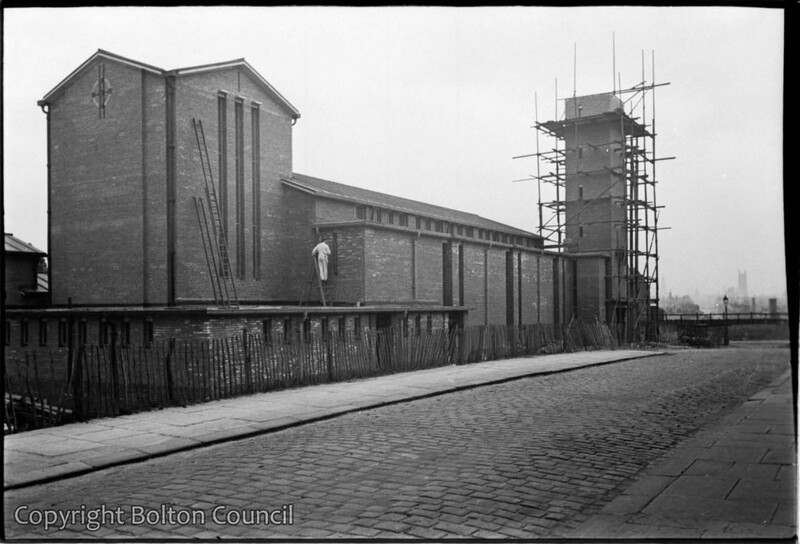 St Chad’s Church during construction, Longworth St, Bolton. The building is still in use as a church today (2012). The Mass Observation Archive holds several accounts of the foundation stone laying ceremony for St Chad’s. This was a ritual which fascinated Tom Harrisson, leader of the early Worktown Study. He saw a parallel with the ceremonies which he had observed whilst living with cannibal tribes in the New Hebrides. I’m fascinated by the significant number of images, recorded here, which relate to my childhood. I attended St. Chad’s Church c1950-66 and was confirmed there.